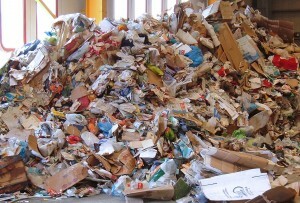 With C&I material consisting of a wide variety of office product packaging, production wastes including cardboard (OCC), wood, metals, glass, textiles, containers and aggregates, the optical sorting equipment has to provide our customers maximum flexibility and adaptability of hardware and software. MSS optical sorters will help you recover valuable recyclables from the recycling stream for increased diversion rates. There are several opportunities in a C&I processing facility where MSS optical sorters are in a position to provide added value for our customers. The automated removal of OCC and cardboard, fiber and paper, plastics containers and plastic film, as well as metals by our optical sorters provide excellent sorting performance and high efficiency. If you are looking to separate out brown cardboard and other fiber materials from the pre-processed C&I stream the CIRRUS® will be your machine of choice. Our newest generation NIR and color separator, with up to 16x the pixel resolution than other optical sorters. It truly provides optical sorting in high definition! We can also build it wider than any of our other machines. So if you are looking to process high throughputs the CIRRUS™ will provide you with an ultra-efficient and unmatched sorting performance. Our longest running sensor-based technology! We have used our own induction-based metal detection technology for more than 30 years in dozens of different applications. The latest generation provides maximum sensitivity at low cost and durability. As a stand-alone unit, the MetalSort™ provides for the removal of metal contaminants (ferrous, non-ferrous and stainless) from C&I streams at high efficiency.